Hot Orange is a beautiful artistic wordpress theme designed by xns.ru. 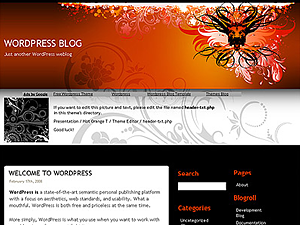 It’s a 3 column, Web 2.0 wordpress template with black background and white main content area. There are two sidebards, both are on the right hand side and contain all the standard wordpress sections. The header hraphic is highly artistic, featuring flower shapes on an orange background and something resembling a devil’s head. The corners of the main content area are rounded.